A sports activity vehicle is the perfect companion for all of your road adventures. The new BMW X5 is equipped with a bevy of impressive performance and design features. The X5 enthusiasts at Bert Smith BMW welcome the opportunity to demonstrate to you all of the unique offerings of this popular luxury midsize SAV as we welcome you into our showroom. 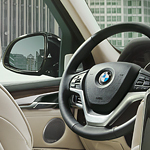 A host of technological features on the X5 keep you more connected than ever before. The patented Live Cockpit Professional boasts two standard 12.3-inch screens conveniently located on both the Center Display and Digital Instrument Cluster. Choose to add the optional Heads Up Display for even more information delivered right to your line of sight. The expansive panoramic moonroof allows you to bring the beauty of the great outdoors into the spacious cabin of your BMW X5. With seating for up to seven passengers, the X5 is ideal for a family.